Zanthropya Ex - "Notlösung Kopfschuss"
Zanthropya Ex, founded in the year 2007 by the 2 brothers, Schinder Papst and JenZo, as well as M. Salazar. All from the town Trossingen, in southern Germany´s music high school town. Very quick other Metal musicians from the region joined in. The idea was the beginning, the making the voyage and the end is far out of site. Misanthropic Metal, as they titel them selves. That is how they began to find their way in the Metal scene. Giving disgusting human doings a psychotic picture.At the beginning of 2008 they recorded the first demo CD „ Apathisch der Sonne entgegen“ as well as 2009 the promotion CD „Seuchenherr“. The band see these as a disappointment. But the band is offert various concerts. They shared the stage of the Legacy Festival 2009 with bands like Torture Killer, Graveworm, Eluveitie, Sodom, Behemoth, Arch Enemy and a lot more. At the Baden in Blut- Festival 2010 they played with Dark Age, Debauchery, Dew -Scented, Neaera, Excremotory Grindfuckers. Although this was so far their biggest success, they shared smaler stages with Deadborn, Fleshcrawl, Imperium Dekadenz, Downspirit, Timeles Rage and many more. Working closly with „Metal Artworks” Zanthropya EX allways presents it self in the hight professionell way of Artwork. With Connie Andreszka „ Mystic Prophecy“ they recorded their first LP-CD „Notlösung Kopfschuss“. Trough his Professionell help and experiance, they found their musical line. This lies with in the Death-Thrash- Metal and the German Vocals all around the Bandleader Schinder Papst.„Notlösung Kopfschuss“ is the projectile in our personell russian rollette and the first soil in our musical self accomplishment. The Misanthropic Gard inspired Zanthropya EX into their prophetic way, lead by „suicide for selfprotection“. Even if we are called by society as decadent, the only decadence lies with in the blind sociaty it self. The clock is ticking – second after second, day after day, year after year. In 2007 the first sound was made by Zanthropya EX like a rushing river of blood and screams, naive but full of zest for action to reflect the world up to the darkest corner of its ugly face. 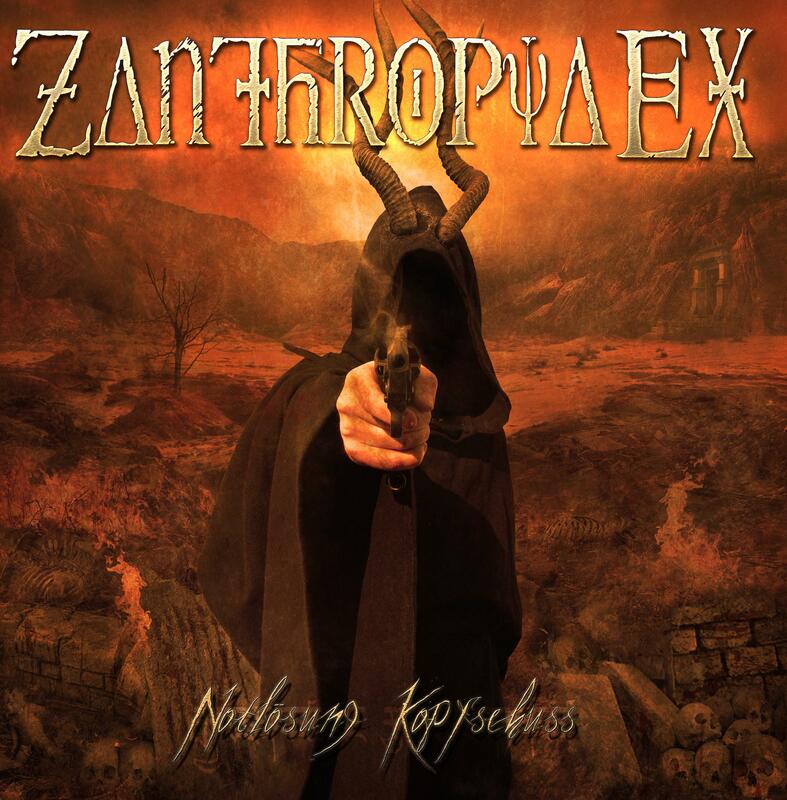 „Bloody, morbid, perverse and brutal - We are the mirror of our time“ (Zanthropya EX) Since 2007, Zanthropya EX are marching throug the metallandscape under the leadership of the brothers Schinder Papst and JenZo. With the longplayer „Hure meiner Sinne“ they are releasing their fourth studio album in the genre named „Misanthropic Death“.